Like an artist using the paint on a palette, Dariusz Malinowski is mixing pollen to create a flowering masterpiece in the form of tropically colored winter-hardy hibiscus. Three years after the Texas A&M AgriLife Research breeding team at Vernon created the first blue-flowering winter-hardy hibiscus, the researchers have come up with a new salmon-colored garden jewel, said Malinowski, a professor in the Department of Soil and Crop Sciences in the College of Agriculture and Life Sciences, and also with Texas A&M AgriLife Research. “In the past six years, we have disclosed to the Texas A&M University System Office of Technology and Commercialization more than 180 unique lines of winter-hardy hibiscus with very unusual flower and leaf color and shape,” he said. With his two colleagues, William Pinchak, AgriLife Research animal nutritionist, and Steve Brown, Texas Foundation Seed Service program director, both based in Vernon, Malinowski continuously works on creating new colors in winter-hardy hibiscus. He said in contrast to the tropical hibiscus, its distant relative, the winter-hardy hibiscus has a very narrow genetic potential for new colors to appear in the process of selective breeding. One reason is the relatively short time breeders have been attempting to create new flower colors compared to the efforts and time put into developing new color combinations in tropical hibiscus. 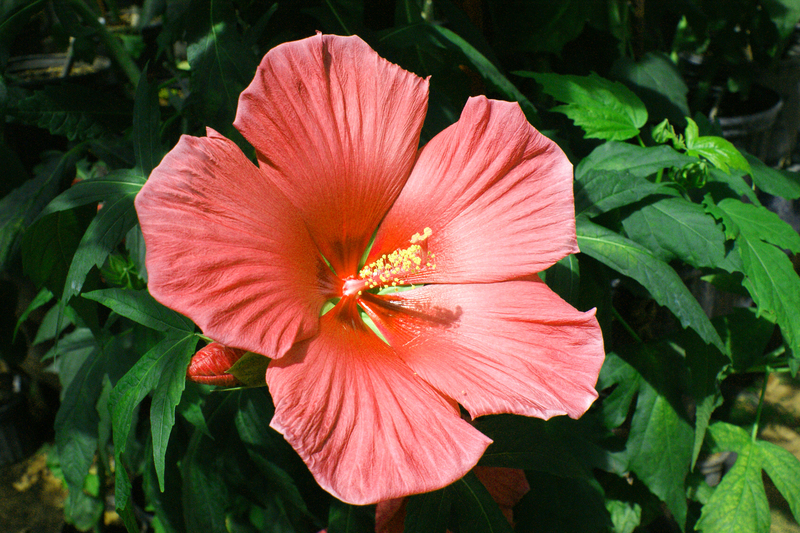 The late Georgia Bost, a passionate gardener who collected numerous winter-hardy hibiscus species and developed several new cultivars on her Hibiscus Hill Plantation at Waller, was the first to believe that extensive hybridization among available winter-hardy hibiscus species would eventually result in creation of new colors similar to those in tropical hibiscus, Malinowski said. “We also believe in this theory and have created to date over 8,000 hybrids among the four native species: H. coccineus, H. dasyacalyx, H. militaris and H. moscheutos, resulting not only in the most illusional blue-flowering hibiscus, but also numerous other colors, including maroon, magenta, dual-colored flowers and the newest with salmon-colored flowers,” he said. Released to date are the Blue Angel, the first blue-flowering hibiscus cultivar, and the Robert Brown, a chimera, a hybrid where both parental genomes do not fuse completely and work independently to some extent, providing an unpredictable dual-color pattern of the flower. Blue Angel was released in memory of The Blue Angels, the U.S. Navy’s flight demonstration squadron, and Robert Brown was released in memory of Brown’s son, Robert B. Brown. The salmon color is the third breakthrough in their winter-hardy hibiscus breeding, after the blue and purple colors developed a few years ago, Malinowski said. However, he said, the program has created a number of unique colors, including all shades of pink, magenta, red, crimson, purple, blue, lavender and maroon. “Interestingly, some of our winter-hardy hibiscus hybrids started to resemble tropical hibiscuses, both with flower shapes and color combinations,” Malinowski said. “The most unusual hybrid resembles a hollyhock when in bloom. Malinowski said the AgriLife Research breeding team expects to achieve the new colors in the next few years. “It took us only three years to come up with the blue color, and at that time I was very skeptical if that was even possible, because blue color did not exist in winter-hardy hibiscus. I am positive we will eventually create an orange-flowering hibiscus,” he said. The winter-hardy hibiscus breeding program at Vernon has been recognized worldwide by breeders and commercial nurseries. The flowers can basically be grown from South Central Texas to Canada, as long as the required winter period is long enough for them to go dormant after the first frost, Malinowski said. The plants resprout from the root the following spring. Brown said several companies are evaluating different materials for commercialization across the U.S. All of these lines are vegetatively propagated; in other words the commercial plants come from cuttings rather than seed. “Once these companies decide they wish to include these lines in their product offering, they will license the products, and propagate to begin to increase their numbers,” he said. Most of the very large ornamental companies have divisions dedicated to the propagation of large numbers of “liners” or small plants from cuttings, Brown said. These companies will then sell the liners to commercial nurseries that in turn will plant them in pots used for commercial sales in big box stores or retail garden centers. This process, once a nursery makes the decision to commercialize a new product, takes about two to three years before the consumer will see the product in the garden centers in great numbers over a diverse area, he said.